Have you ever finished reading a romance novel only to find that you couldn’t let go of the characters? They’ve somehow become ‘friends’ and you’re aching to learn what happens next. Now that she said ‘yes’ to his proposal, will they have a big wedding or will they elope? Will they have children? How many? This is how a series is born! I remember doing this with many books in my younger years. Surely I could’ve handled Rhett Butler better than Scarlett did. And if I were Gidget, I would be faithful to Moondoggie forever, even if he didn’t always say or do the right thing. Eventually, my imagination produced characters of its own and I learned how to watch and listen as they fell in and out of love. Given the number of hours it takes to get the story written down, I found it hard to say good-bye to these folks after saying ‘the end.’ Another Chance was my first book and the first draft rivaled War and Peace in length. More than twenty years later, when I finally published it (after condensing it a bit), I dusted my hands and turned away but … Anna and Michael weren’t done telling their story. I wrote a sequel and lots of new characters appeared, all begging for the chance to tell their story too. I began numbering the books and stopped trying to predict when it will end. Anna Brown didn’t graduate from college until she was near forty, and then had trouble finding a job as a teacher. She was elated when she managed to schedule an interview at John Casey’s Institute for Juvenile Offenders. The board members liked her enough to send her for an interview with the administrator himself – Michael Grant. Given circumstances beyond her control, she’s late and is turned away but fate (or God?) intervenes and she is given Another Chance. Twins! At age forty? 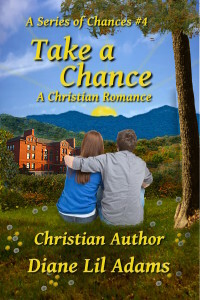 Not By Chance shares the details of those first years together when Anna and Michael face challenges that test their love and their faith. 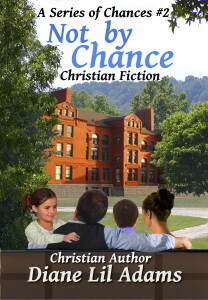 Michael loves his job as Casey’s administrator, but too often, he is forced to choose between the school and his family. When he finally hires Sam Shiloh as co-administrator, Anna pushes him to fulfill a lifelong dream and serve as a missionary for a few weeks. The results aren’t quite what either of them hoped for and Michael ends up praying for One More Chance. When Franny Grant looks in the mirror, she sees an adult, not the silly little girl Sam Shiloh continues to see. How can she compete with the beautiful, mature women who are anxious to catch Sam’s eye? How will she ever convince him to Take a Chance? Tyler plays the starring role in the next book. 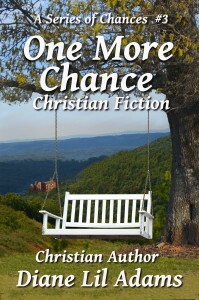 I was going to call it Last Chance, but Anna and Michael warned me against using the word ‘last’ in any of my titles! If you catch yourself continuing the story in your imagination after you finish a good book, maybe there’s an author hiding in you too. Why not give her a CHANCE to be heard? Some of the first christian ebooks I read were yours and I truly enjoyed them all but Another Chance really caught my attention. I have read the first 3 books and plan to read anymore you write about these characters. They are like letters from friends that you only hear from once in a great while. What I don’t like about ebooks is they are not as easy to refresh my mind on things that happened in the books I have already finished. Sometimes when you read a series one needs to look back while read the new book of the series. These people are real and fun to know. Thank you for introducing me to these wonderful books. Thank you so much for your kind words! Maybe I should include a brief recap of the past books before the first chapter? I will give that some thought. 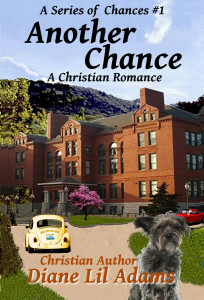 There is a fourth book – Take A Chance, about Franny’s romance. I’m working on the fifth one now – Tyler’s romance, but it doesn’t yet have a title. Thanks again for taking time to comment. Your words are sweet encouragement! Diane, that sounds like a wonderful story, and I love how it just keeps going and going. May you have many more stories to tell in the Chance series. Thanks so much for your encouragement, Andrea! I love books with epilogues! It give me more on when they married, did they have kids or are pregnant…all those little pesky details, lol! But I also do love series books & some stories call for more about the characters. It’s hard to leave the ones you’ve come to know & love. Some characters, I’ve always wondered more about how their lives turned out. What twists & turns happened and how did God work it all out? I realize too, that some stories really do have to end so they don’t seem to drag on & on and readers lose interest. I bet it’s a hard balance for authors! I love the sound of your books Diane! Guess I’ll have to check into getting them for myself. Unless I have them floating around somewhere in my Kindle, lol! I have so many books that I probably won’t ever read them in my lifetime! Thanks for talking about your books here & blessing to you and yours!